The star-studded line up features Sarah McLachlan along with Stevie Nicks, Jann Arden, Hedley, The Boom Booms, Grammy Award winning producer Chin Injeti, along with a special appearance by former president Bill Clinton. 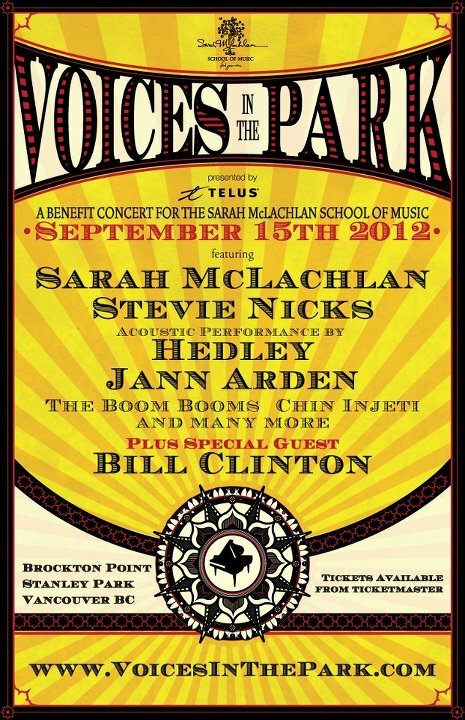 Voices in the Park will be the first major ticketed concert to be produced at Brockton fields in Stanley Park. In keeping with evolving sustainable event practices, concert producers are encouraging fans to attend car-free. Shuttle buses will be running from Park Royal in West Vancouver as well as key transit points in Vancouver, with return fares of just $5 per person. There will be limited reserved parking for sale with concert tickets, but otherwise fans are encouraged to use alternative means of transport and arrive at the site via public transit, by foot or bicycle along the seawall. There will be a free bike valet service at the site to accommodate the thousands of bikes that are expected. An army of volunteers and lit pathways will help to lead fans out of the park at the end of the night. Sarah McLachlan, Bryan Adams, Stevie Nicks, Hedley, Jann Arden, Chin Injeti, The Boom Booms, Hey Ocean! and Whitehorse with a special guest appearance by President Bill Clinton! The Sarah McLachlan School of Music (SoM) provides free after-school music education for underserved and at risk children who face challenging cultural, social and economic circumstances. SoM is founded on a belief in the enriching power of music and the importance of creative community. SoM reach hundreds of young people every year (ages 7-17), providing them with a secure, nurturing and inspiring environment in which they can learn, practice, and connect with others. Now in a premise purpose built for music education, the Sarah McLachlan School of Music provides these students with the space and guidance they need to express themselves. By experiencing the joy of music, they cultivate a feeling of pride and self-worth. Music ignites their passion and energy, giving them confidence, motivation, perseverance, self-esteem, self-discipline, creative thinking, teamwork skills, and determination, all tools applicable to lifelong success. Tickets: General Admission: $85 and no additional Ticketmaster fees! Benefactor: The Voices in the Park concert is a fundraising concert to benefit The Sarah McLachlan School of Music.